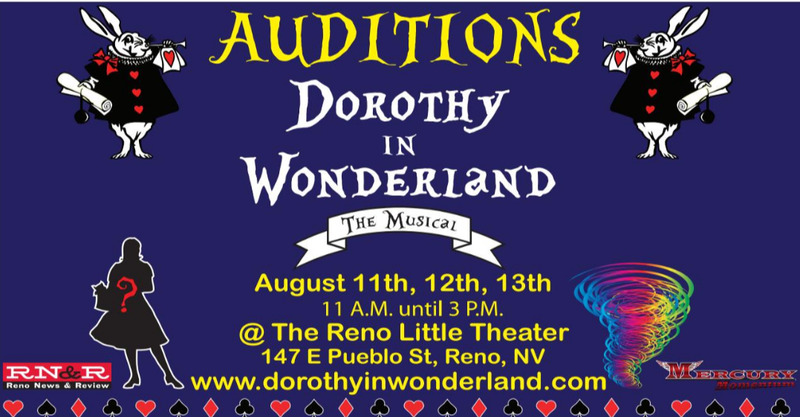 Mercury Momentum, local Reno nonprofit group that produces the Reno Earth Day Event, is pleased to announce auditions for an amateur production of Dorothy in Wonderland, The Musical on August 11th, 12th, 13th from 11am to 3pm at The Reno Little Theater; 147 E Pueblo St, Reno, NV 89502. Callbacks, if needed will be during the following week. Performances: Will be at Cargo on Saturday the 10th and 17th and Sunday the 11th and 18th at 2pm and 7pm for a total of 8 performances in December. Casting: Male and Female singers, dancers and actors are needed for leading, supporting and featured characters. All ages welcome; if under 18, guardian must sign permission slip; if under 13, guardian must be present at all rehearsals. Musical numbers will be choreographed to the ability of cast members. Previous dance experience not necessary. There are 33 named characters in the original script to be cast. The decision whether to cast any additional ensemble members will be determined during the audition process. All who audition will be considered for all applicable roles unless they specifically do not wish to be considered for roles they do not read for. ALL SKILL LEVELS ARE ENCOURAGED TO AUDITION – untapped potential welcome! Please Prepare: One song of your choice with karaoke version for accompaniment. There will not be an accompanist at auditions, so please remember to bring a cd, mp3, iphone, ipod, etc. With a karaoke version of your song. There are likely to be cold readings from the script. Most auditions are expected to take 5-10 minutes each. Rehearsals: Will be held 3 days per week beginning Tuesday, September 13th at 7pm. Additional rehearsals may be scheduled as needed. A mandatory final dress rehearsal will take place on Friday, December 9th. Additional rehearsal information will be provided at auditions. Story: Dorothy, Toto and the characters of Oz get caught in another whirlwind that sweeps them off to Wonderland, where they meet Alice, White Rabbit, Mad Hatter, March Hare, the Cheshire Cat and many more! It’s truly a mad adventure! And you thought the Wicked Witch of the West was bad? Now they face a dangerous new foe — the Queen of Hearts! At least Dorothy’s companions now have their brains, heart and courage! Dorothy, Alice and their friends join forces to defeat the queen at croquet, but will that be enough to return Wonderland to normal and get everybody back home?